War is caused either by an imperialistic stance by an aggressor, a failure of nations to successfully negotiate their differences, or a combination of the two, which is how the United States ended up in World War Two. When Japan invaded Manchuria (imperialism), the United States reacted by refusing to sell Japan oil. This was no small matter for Japan, who bought 80% of its oil from U.S. companies. 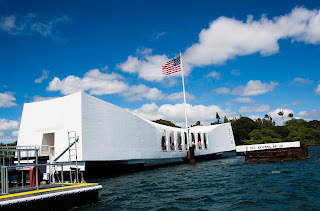 When the terms the U.S. required to begin shipping oil to Japan were too high for the Japanese government to accept and still maintain face—a commodity more important to politicians than to the millions of regular people who suffer when nations resort to war—Japan attacked the U.S. at Pearl Harbor on a date that FDR decried would live in infamy. 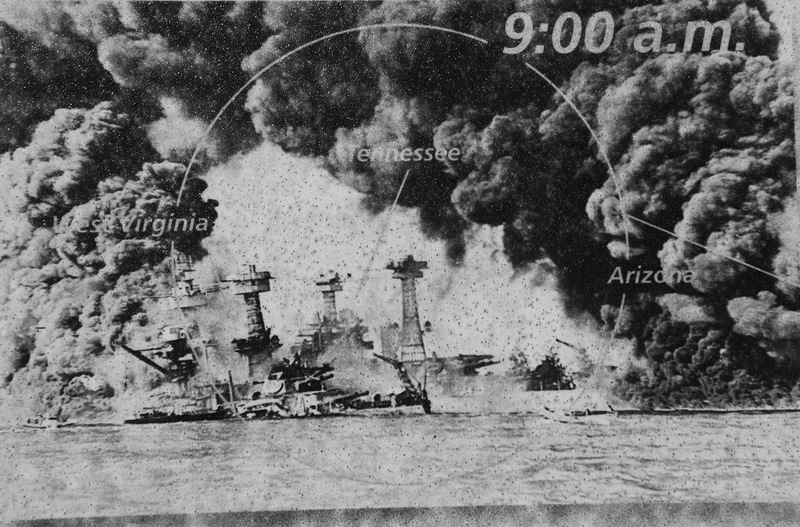 In two hours, Japan sank most of our battleships, numerous other vessels, and killed 2,400 people. 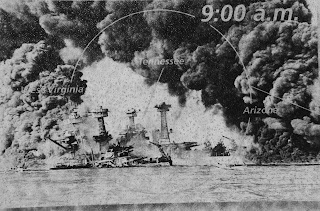 As battles go, the material losses were major (although temporary, as most of the battleships were raised to fight again). In comparison to other battles, the human loss was small. On a single day at the battle of Antietam (Sharpsburg, MD) nearly 23,000 soldiers died. The atomic bomb dropped at Hiroshima killed over 40,000 people that day and 50,000 -100,000 more in the next four months. 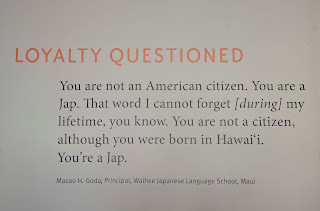 I know all those statistics, but what resonated most with me as I toured Pearl Harbor, part of the World War II Valor in the Pacific National Monument (including the USS Arizona memorial), is the virulent hate so many immediately felt toward those of Japanese heritage living in the United States. In Executive Order 9066, FDR set in motion what would become the mass internment of Americans with Japanese ancestry. In the mainland U.S., over 100,000 were interned. In Hawaii, with a population of over 150,000 individuals with Japanese ancestry, fewer than 2,000 were interned! Did you know the disparity of treatment of between locations? I did not. This was racism, pure and simple. Fear allows presidents to take actions that would otherwise be unconstitutional. FDR subjected citizens of Japanese ancestry to the loss of property, freedom, all citizen rights, simply because of fear that they might conspire against their country. President Lincoln suspended habeas corpus soon after the start of the hostilities now referred to as the Civil War, the War Between the States, or the War of Northern Aggression. The Judiciary determined that the right to suspend habeas corpus resided in Congress, not the President. Lincoln ignored the court order. Lincoln was wrong to ignore the courts. 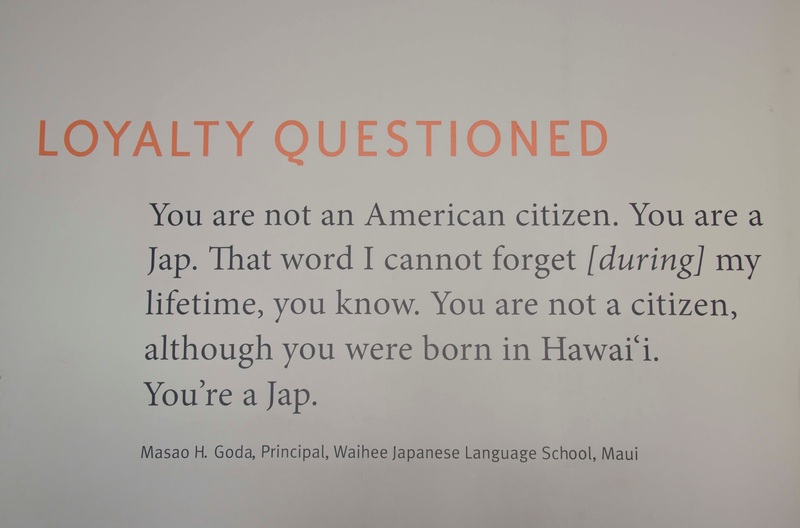 FDR was wrong to tar all those with Japanese heritage with a single brush. Yet, in surveys, Lincoln and Roosevelt are considered two of our greatest presidents. For example, in the Siena College Research Institute, Presidential Expert Poll of 2010, Lincoln was rated #3, FDR was #1. During the McCarthy era, political persuasion (and sometimes only presumed political persuasion) was cause for citizens to lose their jobs, to be blacklisted by industries regardless of whether they had ever committed any act against the interests of the United States. This is our past. We should not run away from it. We must remember it to avoid repeating it. We feared Native Americans and tried to exterminate them, or at least confine them to reservations. We feared Southern sympathizers and allowed presidential power to trump the checks and balances of our three branches of government. We feared the Japanese and illegally interred 100,000 fellow Americans. They are correct that I am concerned about losing what I most value. However, we have very different concepts about what has greatest value. If I do not stand with Muslims and Jews and Blacks and Mexicans, if I do not stand with the poor regardless of race or religion; if I don’t object when others’ rights are diminished in response to fear promulgated for political gain; if I allow anyone to trample the inherent worth and dignity of another, I have lost my own soul.